HI family! ahhhh I love you all so much! I am so happy. A wee bit stressed (ha what else is new with missionary life?) but happy. Another new transfer, new area and new companions! I like change! Bloomfield area has been awesome, I really don’t know how I’m going to get everything done this transfer…or at least all the things that I WANT to get done but it’s okay I have AWESOME companions that are sooo helpful and wanting to learn-really solid unity to start off this transfer. First of all my new companions are Sister Lundgren (she’s been out 6 weeks and was already in this area) and Sister Merrill (fresh from the MTC). I love them, the Lord truly blessed me with these 2 sisters. They’re pretty different personality wise, well.. we all kind of are actually but we work very well together. Again, so blessed. It’s amazing that the Lord trusts me enough to train 2 new missionaries at once when I myself have just finished my 12th week in the field but hey, he gave me one last transfer so why not give me 2 this transfer?? Haha! love it. I am so grateful for this opportunity. I feel like a parent, they’re my little daughters watching my every move. Asking questions and looking to me for answers…I am trying so hard to set a good example, specifically a HIGH standard with a good work ethic in the mission. I am happy to do that and although it’s a HUGE weight, the Lord is strengthening me. As He has through out my whole mission thus far. I like being the mobile missionary that I have been, the Lord has needed me in different places with different people through out the mission and I am happy to go where He wants me to go. I know everyday I don’t always feel like that but all in all it’s true. He has been using me as an instrument in His hands. Sometimes I don’t know what else I really can do, but apparently there’s more of me to give. To tell you about our area, we are over 2 wards. A singles ward and a family ward. 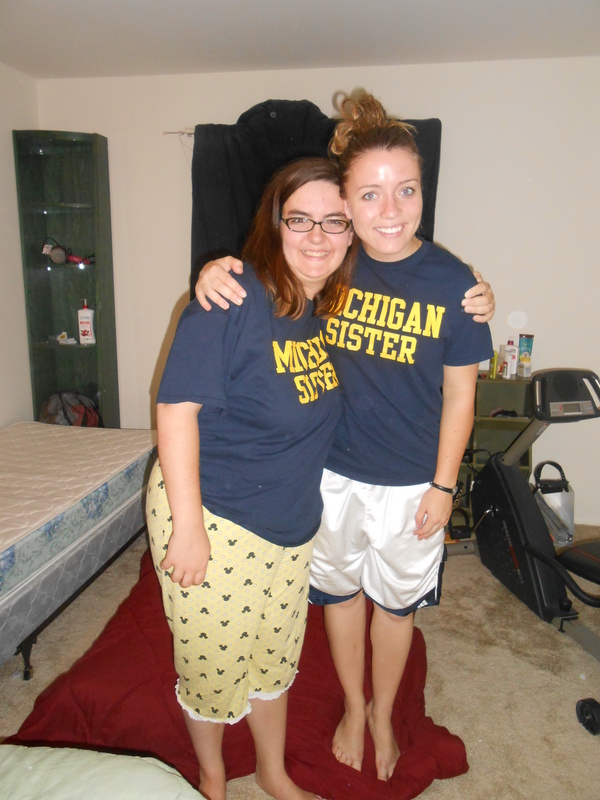 And yes, we’re the only set of missionaries for both! BOTH!?? yes. I’m used to having 2-3 sets per ward haha rather than 1 set for 2! But it’s great-sure keeps us busy.. It’s just nuts, there’s so much to do, but not to a point where it’s impossible-no no. President had told me that I was coming into the area to…clean up things/whip them into shape. It had been a little neglected and there was more time spent hanging out/socializing with members rather than teaching. We’ve already had to drop a couple investigators for the time being because they were simply meeting with the missionaries to have a study time, like bible study. That’s not our purpose as missionaries. 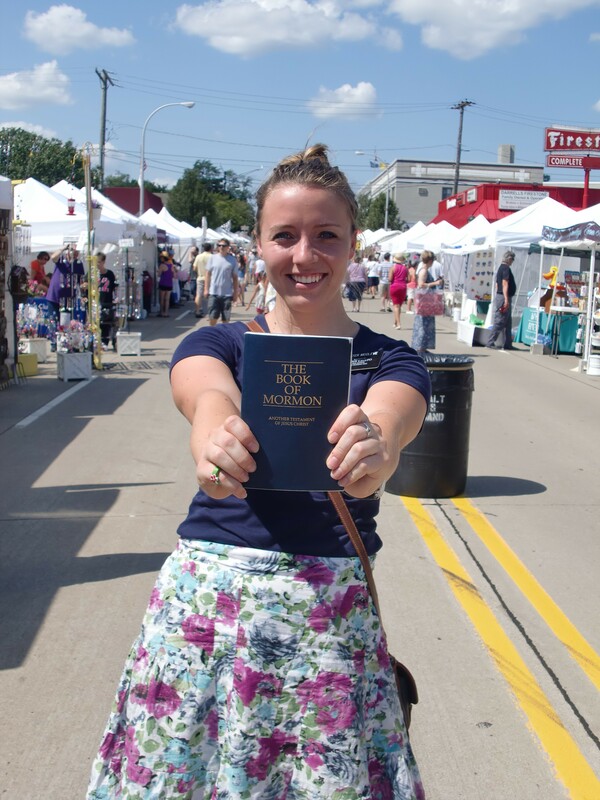 We are to invite others to come unto Christ by helping them RECEIVE the restored gospel. Not just talk about it. Our ward mission leader in the family ward is Scott Romney-Mitt Romney’s brother. He is a funny guy, very to the point and stern and he talks like/sounds like Mitt too haha He’s like 70 something, but still pretty energetic. THe ward seems very aware of the need for missionary work but the DOING part is slacking a little. We’re hoping to get into members homes and review the ward mission plan and leave them with commitments to get them to share the gospel. A perfect example we had was with the Molleda family last night. They are from mexico and had us over for dinner-dang good food oh my goodness I was in Heaven. Their accents were super heavy too and my heart ached to be around foreign people-particularily in Brazil but it’s okay! I am supposed to be here haha anyways. We had a lesson we wanted to share with them afterwards about the gospel and then pr ying as a family to know who they could invite to learn more about the gospel this week. Before we even go to teach the lesson they went on to talking about all of these different people they’d been thinking of that might be ready to come have dinner/with us missionaries over. And then the wife herself said… “maybe we need to actually pray about this more” which was awesome because that’s exactly what we were going to commit them to do! Pray together as a family to see who they needed to invite to learn more about the gospel. We shared with them Alma 16:16-17 and talked about how the Lord truly is preparing people to hear the gospel 🙂 It’s just a matter of praying and finding out who’s ready on the Lord’s time right now. They’re going to do that this week and friday we’re coming for dinner for a mexican birthday since It’s sister Merrills birthday and they’re going to invite at least 1 person over that they prayed about! 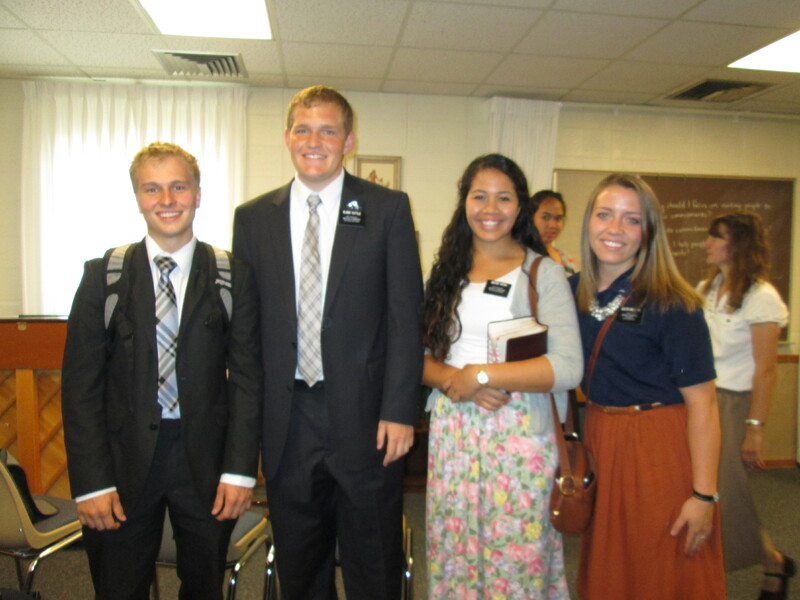 I’m so excited and love member missionary work. Dad, your story about Harley Dave was awesome-I love that you said, “It was so easy” it is easy! I love it 🙂 now we just need to meet with more members and get them PUMPED to share the gospel. Every invitation to learn more is a success whether the people get baptized or not. This is eternal life we’re leading these people to, and everyone is on their own timeline. But we plant seeds here and there with people we see everyday-that is missionary work! The seed will grow. We musn’t get discouraged. This is the Lord’s work, it is going forth! 2 other really cool experiences that I wanted to share that happened this week. 1. 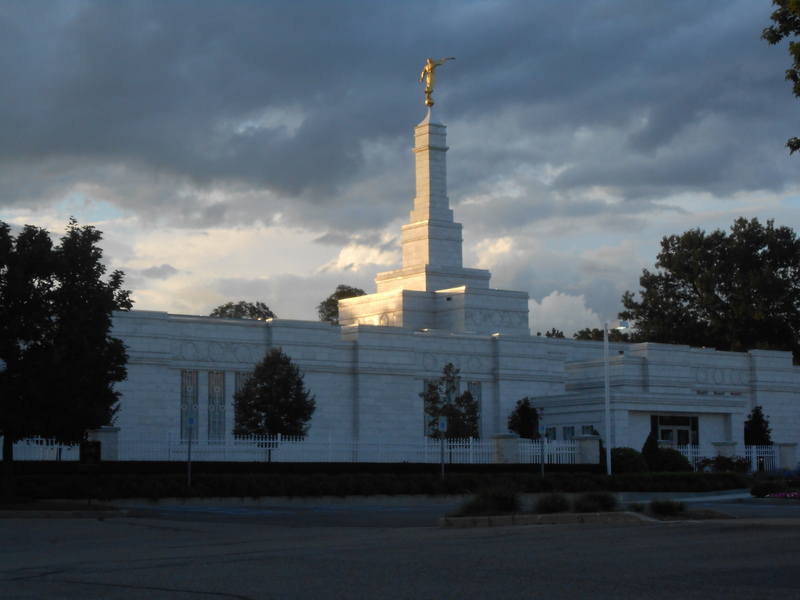 We got a call during the week from a member who explained that she needed a spiritual uplift and wanted us to come teach her the missionary lessons. At first I thought that the home/visiting teachers should be doing that-teaching the new member lessons…but before I said anything sister lundgren told her we’d come by that week. I was worried that this wasn’t really something that we should be investing our time with because she was an active member and I honestly thought that she was just lazy to not take the time to study and pray on her own (primary answers) and wanted us to just teach her. -mistake number 1. Well we went to her house and I wasn’t sure what was going to take place. We sat and began talking with her. She then expressed to us that she had grown up in the church and then about 10 years ago went inactive for about 7 years. She had then come back slowly and since then has been becoming more active but she was still empty inside. Tears filled her eyes as she began to cry telling us that she so badly wanted the spirit in her life again but she felt so disconnected she didn’t know where to start. She was too ashamed of the way she felt and didn’t want other members to know. She felt guilty for feeling this way. She always believed but she said that she just felt so lost still…she was afraid of losing hope. This was the most active and involved she’d been in years and wasn’t sure what more she could do. She had been talking with her brother who had told her to call the missionaries for help. And that’s what she did. We taught her the restoration lesson and committed her to begin reading the Book of Mormon and SINCERELY praying to feel the spirit. The spirit was so strong as we bore testimony to her that she would be able to feel God’s love in her life as she strived to come unto Him. My heart was immediately softened and remorse filled me as I reflected on my jumped-to conclusions previously about this sweet woman. Laura, like all of us wanted to strengthen her faith that she thought she’d even lost. She wanted to draw closer to God again but didn’t know how…the thought of her calling us missionaries and us sending her off instead to get in touch her home and visiting teachers makes me sick. I am so grateful that sister Lundgren immediately answered her yes and that we came. We are going to continue meeting with her and teaching her-I love knowing that we are helping her and lifting her spirits there is a love that comes from serving others. I have felt that so strongly with her. I feel so blessed to have been able to reassure her that there is hope and that it’s never too late. I felt the spirit bare witness to me of that as we talked with her. This experience has really changed my outlook on a lot of things and I was called to repentance soon after. All of us go through times of faith trying experiences but we are never too far gone. Our Heavenly Father is always there, waiting to hear from us, waiting to bless us, waiting to fill us with His love and peace. We musn’t give up on Him, because He never will give up on us. The other cool experience was last night. We are teaching an investigator Lizzy who was baptized but her records were lost. She’s 15. Her mom and dad are divorced and her mom has recently been reactivated. We got to the lesson a little early and we were going over what we were wanting to teach in the car. I looked out the window and saw a man walking around outside the house. Sister Lundgren said that could be the dad who is sometimes around, she didn’t know his name. they had only met once. I felt like we needed to go talk to him. I guess he was there helping remodel the kitchen that night. We walked up the driveway and saw him sitting down smoking a cigarette. We started talking with him as he smoked and puffed out his cigarette- he didn’t seem at all stand offish as we approached him. I was pretty nice but still forward with him, asking questions about his life to get to know him better. He was pretty easy going and friendly, he seemed to like us. We continued talking and then of course I asked if he’d been to church at all lately. He chuckled and said “I can’t go to church, I smoke!, no one would want me there” I told him that it didn’t matter that he smoked and that people would be happy to see him come back. He seemed thoughtful as I said that and then explained a bit more of his situation. I then asked him if he had a desire to go back to which he responded that he hadn’t really thought about that for a while. But now that we brought it up that he probably does and that he should consider it. We then told him that we didn’t think that this was coincidental that we bumped into him to which he agreed with a grin. 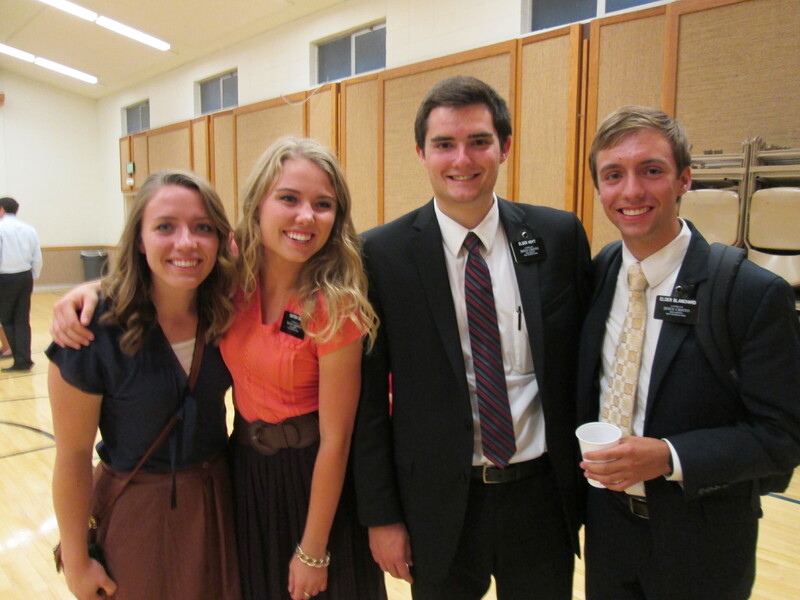 Sister Merrill then asked if we could come visit him and he said yes. He’s going to call us after he figures out a time this week that’s best. He looked at me and said ” Ya know, you’re pretty straight forward….like right to the point but I like it, I felt like you were being real” I really think he will call us, there was definitely something I saw in him that told me he needed this. He needed to meet us. I know that the spirit prompts so mildly and subtly at times and we need to be in tune to hear it and then act upon it. That definitely happened to me last night and we are excited to start teaching Mark 🙂 Again, it is never too late. Never too far gone. 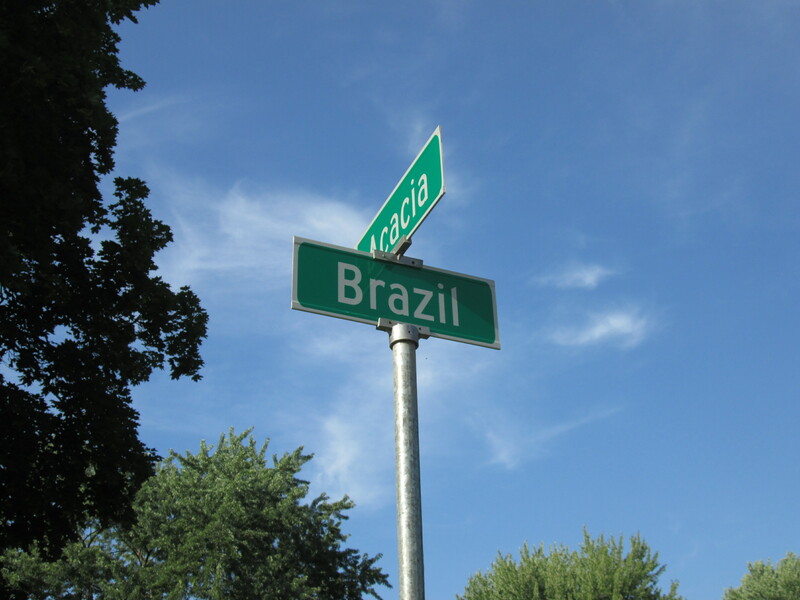 Hi family I am officially in my new area in my trio in Bloomfield MI. It’s awesome, I’m so excited to be here! Mitt Romney’s brother (scott romney) is our ward mission leader. His wife took us out to lunch today haha so rad huh?. My 2 companions are awesome, I am SO BLESSED. We are in charge of 2 wards, a YSA branch and a family ward. Only with us as the set of missionaries in there-CRAZY. So much to do but it’s awesome. 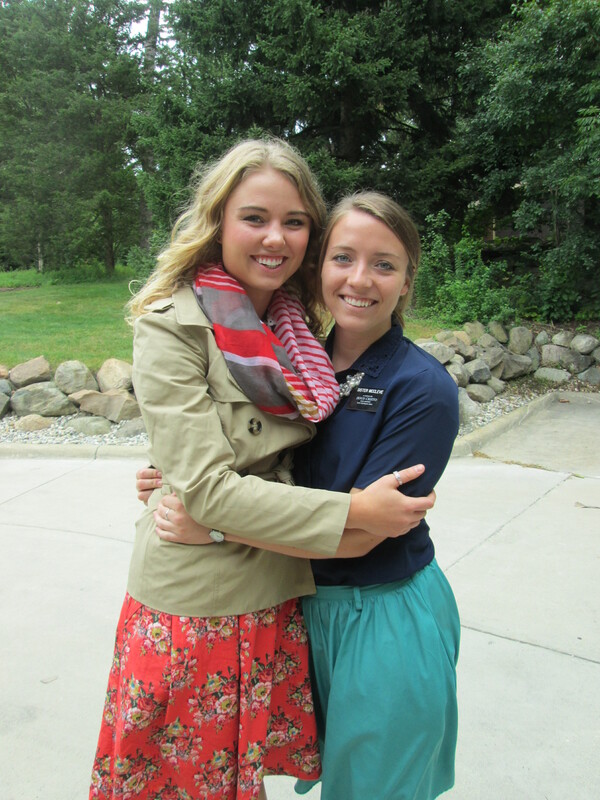 Sister Merrill and Sister Lundgren! This week was awesome we went to a new missionary training meeting on Tuesday and president really focused on what it means to become a chosen missionary. Since many are called but few are chosen-pretty deep stuff, loved it. I still have so much to learn, it’s funny because I’ve never really been all the way trained? and guess what….I am training again ahah. I am getting transferred to a new area and will be training in a trio. 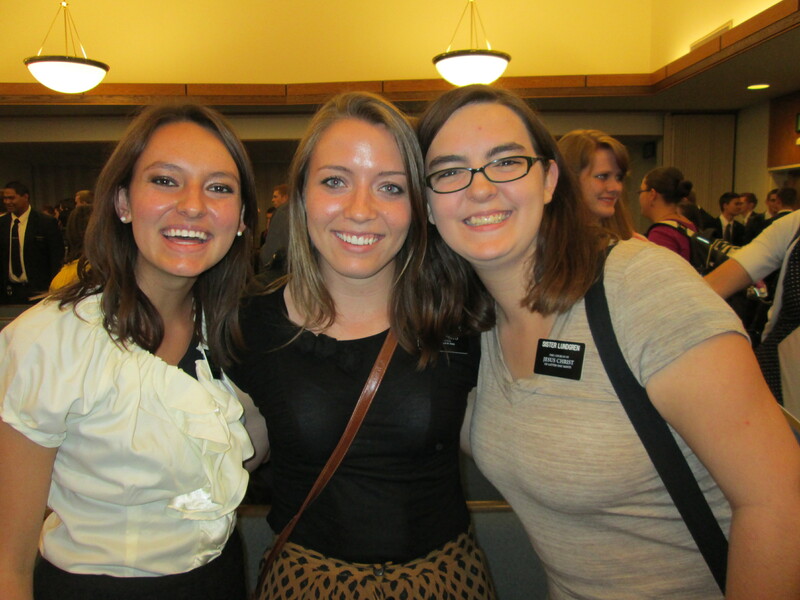 A new sister that’s fresh out from the MTC and another sister that’s been in the area already for 6 weeks. Apparently there’s been….some slacking off going on and basically president wants me to go in there and whip things into shape. Boy am I glad to do it! I am super excited! 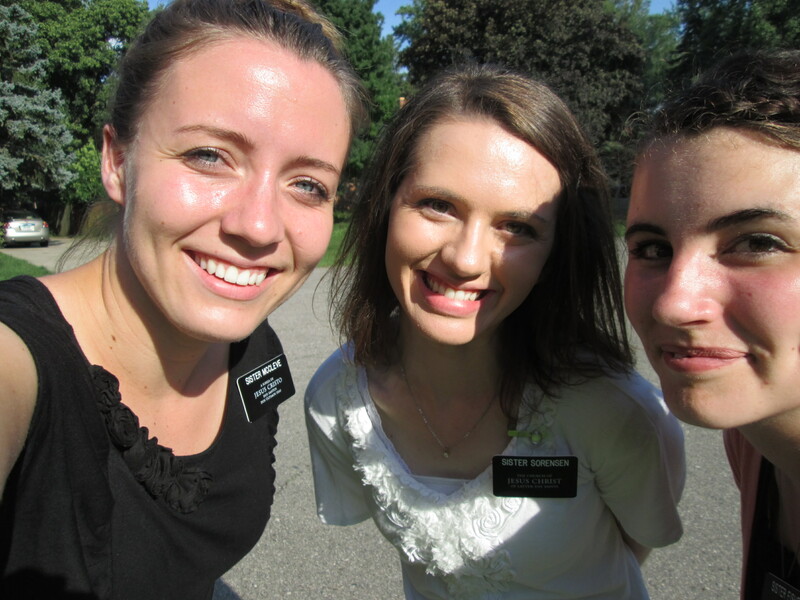 I hope I can still be a good trainer with this new sister and still help finish training the other 6 week old missionary! SO MUCH TO DOOOO! MORE stories and adventures to come. This week was great to end here in Livonia, we went to the temple Thursday, had an awesome district work out Friday and played ultimate Frisbee at 5:45 am (ill attach pics) we had an amazing FHE lesson with a member family last night that really was incredible as the spirit touched the hearts of those we taught and we were able to discern needs. 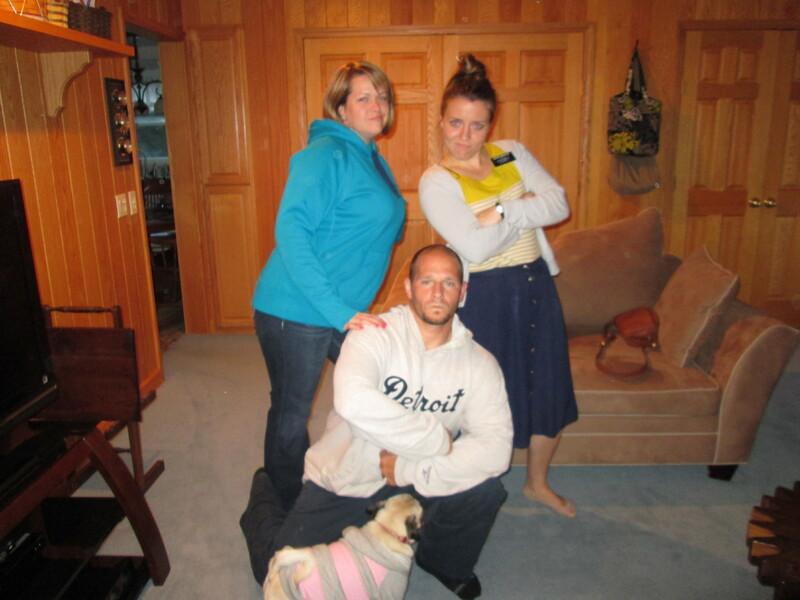 This family, like many need to continue to strengthen their testimony and become converted unto the Lord. We’ve been seeing low retention and too many recent converts dropping off out of now where 😦 I’ve felt such a desire to reach out to these families and am excited to continue doing that in my new area. 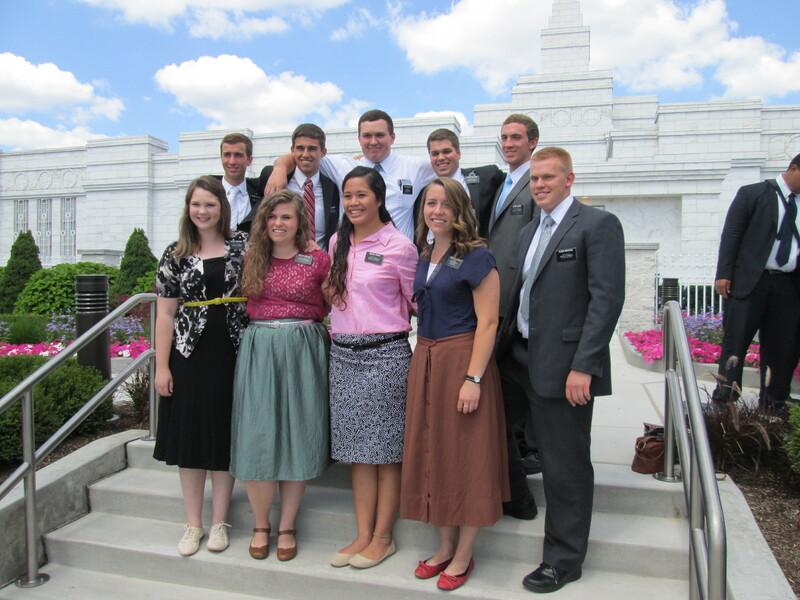 Especially since there seems to be a not so great trust between the members and missionaries from what I’ve been told. I am so motivated to HELP ALL I COME IN CONTACT WITH to Come Unto Christ. That’s what I’ve been trying to do and will continue as the Lord guides me. This is what a mission is all about. We are leading these people to eternal life, not just baptism…we are apart of something so great. I love you all and know that there is serious growth that comes from trials as we LOOK to the Lord and use His atonement-the blessings that unfold are more than we can ever imagine. I know that’s true. I’ve experienced that since I’ve been out as a missionary. The atonement is real, all of us can receive the strengthening and enabling power that it has. 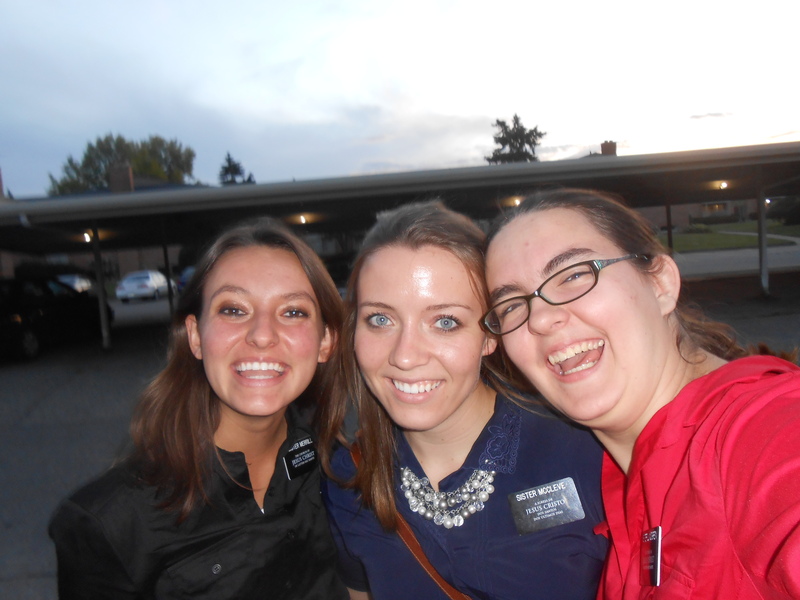 Sister McCleve, the mobile missionary. This week is kind of a blur. lets see Tuesday we got taken out to olive garden by a woman that works at the senior center that we do service for every other week or so. She loves us. She’s in charge of all the activities that go on there at the senior center. She’s Lutheran and although she’s very strong in her faith she did want us to teach her more about we believe. So of course we planned on just meeting at her house or the church and having a lesson but no no she wanted to take us out for dinner haha. Did I feel spoiled? yes. We gave her the restoration lesson and when we gave her a book of Mormon she said “Oh can I keep this?… \I was hoping you’d give me one” haha. She is going to read and pray about it. Her son is a pastor and when he found out she met with us he went over and had a chat with her for a couple hours she told us later on in the week. She didn’t seemed swayed though, she’s going to come to the mission fireside that we have this Thursday night. We’re trying to invite everyone we meet with this week. Hopefully they’ll all come. We had another lesson with Dan the non-believer guy that we taught the Plan of salvation to with leaves and pinecones 🙂 Amazingly enough he said coming into this return appointment he’d been having a rough couple days. And after we taught him the restoration and had a great discussion he told us how much better he already felt 🙂 He continues to say “now although I can’t say I fully believe all this…but it really does make sense” and he told us how he was expecting something different by meeting with us for a 2nd time. Like that we were going to go off on him about how he needs to be saved and that he has to accept and believe this all right here right now like he’s experienced in the past. And once we finished the lesson he smiled pleasantly saying “Ya know, this wasn’t what I expected from you ladies, I like this”. We continued to tell him that as missionaries we are here to INVITE. To teach and Invite and it’s up to whomever to decide if they want to accept these things or not. We all have the gift of agency, the ability to choose. I am so grateful for that gift that enables us to make our own decisions and learn from our own experiences by the choices we make everyday. He said he would read the book of Mormon. Not sure if he’d be willing to pray since his belief in God isn’t really there so we’ll see how he’s doing when we meet with him again this week.